Accordin to ChemOrbis, players in Italy started to express their expectations for September after they returned back to their desks following their summer holidays. These expectations called for the continuation of the current downward trend for another month given weak demand and lower upstream costs stemming from weakening crude oil prices. At the beginning of the week, Brent oil futures declined by $2.70, or 6.1%, to settle at $42.69/barrel, dropping below the $43/barrel threshold for the first time since March 2009, according to weekly average prices on ChemOrbis Price Wizard. Naphtha prices, meanwhile, have dropped below the $400/ton threshold in Europe to be currently reported at around $350/ton amidst falling crude oil prices and weak downstream demand. Nearing the end of August, decreases of around €100/ton from July are passing on spot PP deals. A distributor concluding their late August deals with reductions of €100/ton for Central European cargos reported that demand is very weak and they expect to see lower prices in September similar to the decreases seen in August. Another distributor said that they anticipate significant declines of €100/ton on PP prices in September due to the extremely low energy prices and weaker feedstocks costs as well as quite comfortable supply levels and slow demand. 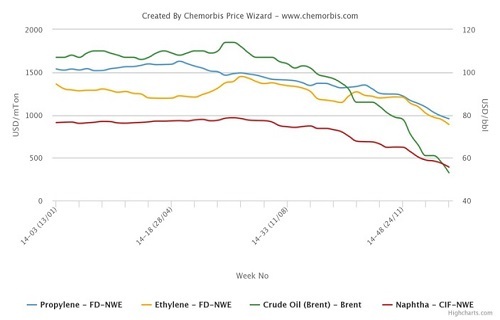 “We sold most of our allocations in the first days of August while now we are waiting for the new propylene contracts to be settled in order to decide our price policy for September, but we expect prices to post further declines in September,” said a third distributor concluding deals for West European cargoes with decreases of €90-100/ton from July. A converter securing limited volumes from his regular Northwest European supplier also stated that they think that prices still have some room to post another decrease of around €100/ton in September because of lower crude and naphtha costs. Meanwhile, an initial September propylene contract which has been settled with a decrease of €110/ton ($125/ton based on current parity) from August at €820/ton ($933/ton) FD NWE also supported the players’ bearish expectations for September.